ACCI’s vision is: "To be a significant force in the development of a vibrant and sustainable business environment in the region". The Albany Chamber of Commerce (ACCI) is a not-for-profit, member driven proactive organisation providing professional services, cost-effective information and support for business. ACCI receives no external funding for its day-to-day operations allowing the provision of fully independent advice and assistance on a broad range of business activities and information. ACCI can refer businesses on to private and Government agencies for assistance, and the ACCI’s alliance with the Chamber of Commerce and Industry of Western Australia (CCIWA) provides members access to an extensive suite of business services. The chamber is represented on numerous committees and boards to lobby and provide input into policy development and reviews. The chamber comprises a wide range of businesses and organisations representing a diverse number of industries, and its executive committee is voted for by its membership. The ACCI is a story of achievement over 125 years, by one of the most influential bodies, in economic development of Albany region. The following are excerpts from Les Johnson’s book The Albany Chamber. 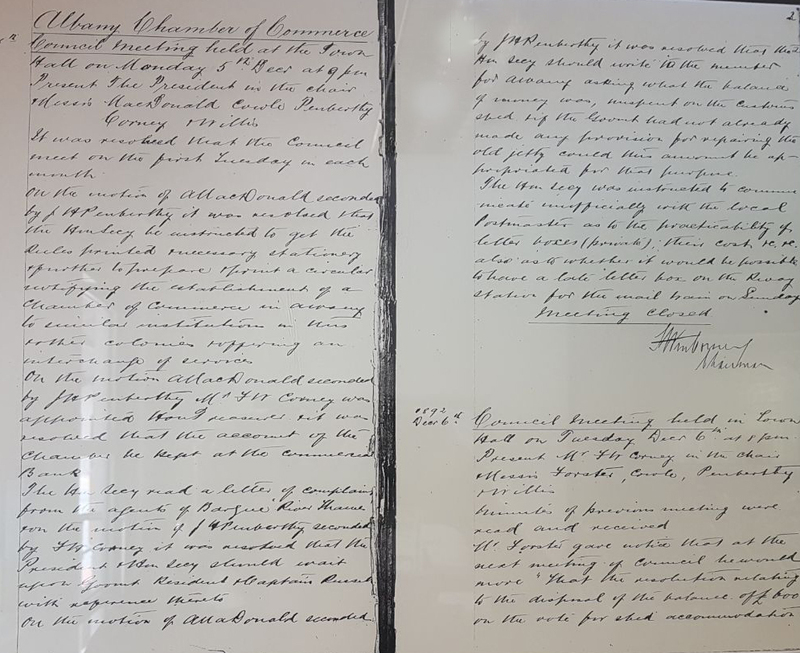 "The Albany Chamber of Commerce was born on the evening of Monday, 28 November, 1892, at a meeting chaired by the mayor, Mr John McKenzie, in the Albany Town Hall." Its foundation president was John Moir, or ‘Gentleman John’, as he was known. In 1892, the mission of the chamber was "to watch over and protect the general interest of commerce; collect information on all matters of interest to the commercial community; use every means within its power for the removal and redress of grievances; and for the promotion of the trade of the colony". These ideals set the foundation for what the chamber represents today. The fact that old and new businesses alike have sought the opinion of the chamber on various matters over the years is an accolade for the achievements of the chamber over almost 120 years of history. Each side of the stylised triangle contained within the letter ‘A’ of the logo represents ACCI’s triple bottom-line philosophy of Planet (environment), People (social & cultural) & Profit (economic). The colours are reflective of the environment in which we live, work and play. The green in the logo represents the green of the surrounding countryside incorporating farmland, horticulture, agriculture, forestry, agribusiness, viticulture, as well as the many national parks and public open spaces that contain many of Albany and the Great Southern’s famous tourist attractions. The blue represents both the sea and the sky. The sea, consisting of the Southern Ocean, King George Sound, and Princess Royal Harbour, home to many commercial fishermen and tourism, cruise and charter boat operators who earn their living from the sea, not to mention the Port of Albany, so vital in the role it plays in the economic lifeblood of the region. The sky is home to Albany’s prolific birdlife, which attracts birdwatchers from around the globe. It is also important as an air transport link for local, interstate, and international tourists and business travellers. The night sky, devoid of light pollution, provides a haven for stargazers.